It’s not just a great Utah biking trail: The International Mountain Bicycling Association has granted Mid Mountain Trail the coveted “Epic” designation. And it’s not for the faint of heart—or out-of-breath—as its single-track course takes bold riders on 3,000 feet of elevation change, peaking at around 8,000 feet. Accessible via several trails around Park City Mountain Resort, the loop trail is not just a physical challenge—it’s a thing of beauty, with picturesque moments of riding through the mountain trees and emerging into stunning views of the world below. BackcountryPost.com began in 2007 as a means for consummate hiker/backpacker Nick Woolley to blog about his travels and love of the outdoors. The website has become a vibrant community forum for enthusiasts to share their own adventures, secret spots and photos. Woolley and the website’s 600-plus members provide trip reports and trail guides for regional adventures, from Island in the Sky and Stansbury Island to The Subway and the San Rafael Swell. The site’s logo is a cairn—a stack of stones marking a trail—and if you follow this site, you’ll certainly find your way to some sweet adventure spots. 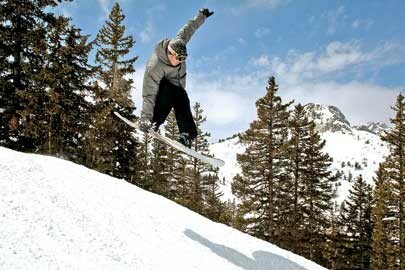 Year after year, snowboarders locally and nationally rave about Brighton’s snowboarding pleasures. While the mountain itself is shradical, riders also take advantage of the rails and jumps in Brighton’s multiple terrain parks, plus t he regularly groomed halfpipe. And as exciting as it is for experienced boarders, Brighton is just as great for those getting started—weekly classes are available for kids as young as 4, and the Pee-Wee terrain park provides a safe place to learn tricks and jumps among other rookies. Why walk when you could do a little dance? Inspired by a funny YouTube video of national reporter/comedian Ben Aaron “dance walking,” Kaneischa Johnson, the “queen of the Provo scene,” decided she needed to “churn the butter,” “push the lawn mower” and “shake it like a Polaroid picture.” In partnership with Velour Live Music Gallery and Downtown Provo, Inc., Johnson launched the first Dance Walk in conjunction with the First Friday Gallery Stroll in July 2012. The monthly summertime event began at the Utah County Historic Courthouse and scooted along, with 60 to 120 people in tow, on a scenic tour of downtown Provo, ending in time for the Rooftop Concert Series. Boogie on, Provo people. Americans will take any sport and make it more extreme (except cricket, because it’s too confusing). Take yoga, for instance—more specifically, the physical asana. American yogis have been known to practice poses on cliffs, while suspended by fabric from ceilings or even deep within a 55-foot-tall, beehive-shaped limestone crater near Midway that’s home to a 96-degree hot spring. If that weren’t enough, Park City Yoga Adventures has folks doing the upward-facing dog on floating paddleboards. In normal practice, if you fall, it hurts; here, at least, it’s warm and soothing. Is the best hiking spot one that caters to newbies? Or one with the most challenging trails or the most spectacular views? Maybe it’s a little bit of all of these things—which is what Millcreek Canyon provides. Beginners and families with younger children love the Pipeline Trail, with its gradual rise over 6.7 miles. Or, there’s the challenge of Grandeur Peak, rising 1,700 feet to the saddle for a payoff of a gorgeous scenic look at the valley. And, unlike many other hiking areas, Millcreek Canyon is dog-friendly (even off-leash for selected days of the week).